Google today finally launched Android Wear 2.0, the latest version of its wearable-focused operating system. Apart from releasing the new software for wearables, the announcement also included the arrival of two new smartwatches that use the new software at their core – the LG Watch Sport and LG Watch Style. Both of the new devices are available from February 10th. Kicking things off with the new watches, aesthetically they are similar in that they both pack circular OLED displays that measure 1.38 inches on the LG Watch Sport and 1.20 inches on the LG Watch Style. The Style is the thinner, more elegant of the two and also has the most strap options while the Sport brings with it many more features, including cellular connectivity, GPS, NFC, and a larger battery. Both watches feature a new “rotating power button,” which sounds suspiciously like the Digital Crown that lives on all Apple Watch models since 2014. Initially only available in the United States, the LG Watch Style can be picked up at your local Best Buy or indeed the Google Store for $249. Those who would prefer the additional functionality of the LG Watch Sport will be able to pick one up at AT&T, Verizon, and the Google Store for $349. Color options include silver, rose gold, and titanium for the Style and titanium and blue for the Sport. 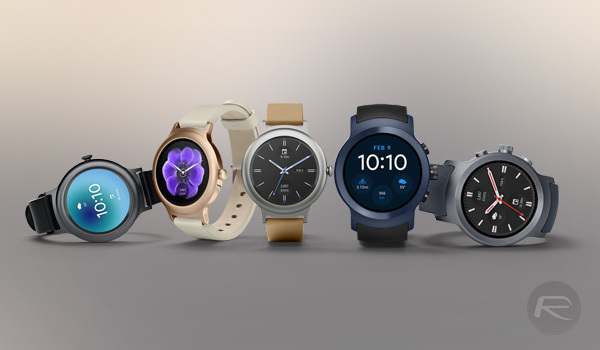 Software-wise, Android Wear 2.0 – which was announced almost a year ago at I/O 2016 but released only now – includes improved support for watch faces, which can now be customized, as well as the growing Google Assistant, Android Pay, ability to install apps without connected phone, and more. Mostly, the software plays a catchup to what Apple Watch and Samsung’s Tizen-based Gear S line of smartwatches have been doing for a while. You can now personalize your Android Wear always-on watch face with information and actions from your favorite apps. Simply glance at your wrist to check your next appointment, stock performance, progress on fitness goals, or whatever is important to you. A quick tap on your watch face lets you instantly order an Uber ride, start a workout, or get in touch with your significant other. Interested in different info throughout the day? Just swipe to switch your watch face as you go from the office to the gym to dinner with friends and home again. With both watches available to buy this week in the United States, and further territories expected to be able to order one in due course, we’re pleased to see some added competition for the watchOS in the shape of Android Wear 2.0. The more the competition, the better all smartwatches will become. Three watch had a display, just like the Apple watch. Oh, and it has a strap too, but it’s not up to par with the Apple watch. worst ad I’ve seen in a long time. I guess the digital crown is now a good idea since google adopted it, I remember so many mocking comments about how stupid and unfriendly it really is when the first Watch debuted.